Today we are going to look into two bedrooms in our little cape! Our master bedroom- turned into a Winter Master Bedroom. And Finn’s bedroom all decked out for a fun Kids Christmas Bedroom! I shouldn’t say “all decked out” I added a couple little things. But he does have a really cute tree so it feels decked out and super festive. We spend a lot of time in both of these room’s, so I love to add some twinkle lights and a little Christmas decor. Actually in a small, 1200 square foot home you spend a lot of time in EVERY ROOM! I am also joining 15 other bloggers to share their Christmas Bedrooms! Ella Claire Inspired shared her kid’s bedroom decorated for Christmas too. So make sure to hop over to their blogs for more inspiration! The best part of our winter bedding is that my bedding is all the same…except for the one pillow front and center. I simply put the white euro shams in the front and stacked the shams and the pillows that we sleep with behind the euro shams. The front pillow is the softest pillow ever!!! 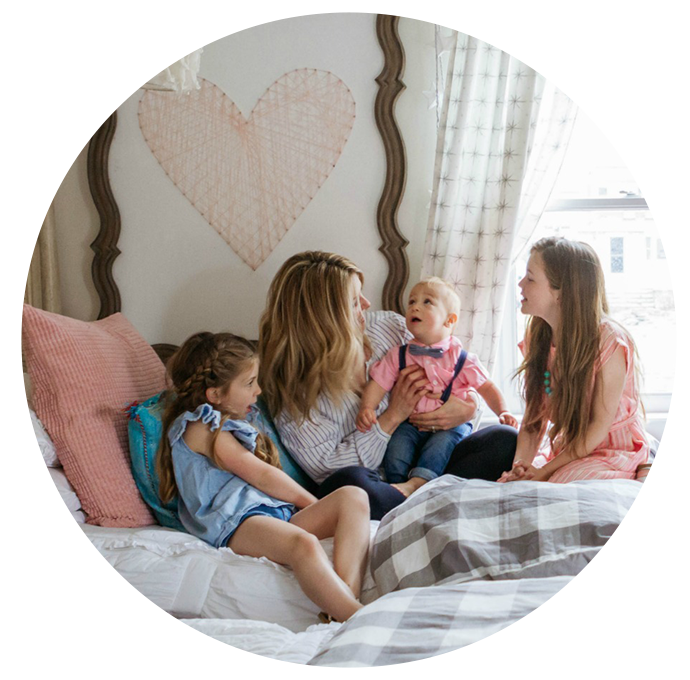 You can find it HERE and all my other bedding on THIS blog post with budget friendly options! I did the same faux garland that I did last year and added some lights (THIS garland is similar but with lights!). Kevin was teasing and saying it’s very #hygge and made sure I secured it (last year it fell on our head) with just a couple really thin nails at the top of the headboard. This year I added some pom pom garland to it (similar HERE). Simply changing out the accessories makes a difference with pieces you already have in your home. I took out the pink vase on the nightstand and switched it with a white pitcher I already had, to match the colors. Shop your home! I also moved the hats that were above the bed and put the horn plaque I already had. Simply hung a fresh $5 Trader Joe’s wreath on it! Over on this side of our 10×12 bedroom we have a cozy chair and in the winter I like to add a throw wherever I can. In hopes that I can one day sit down and read a book or just sit:). We also added our same cordless bamboo shades to our master bedroom, the same that we did all upstairs. Find the blog post on our bamboo shades HERE. The wreath addition hanging over our beach picture is a faux cedar wreath. Easy way to change up your artwork! (Find wreath HERE). I hope you enjoyed that tour! You can shop our home HERE. Now moving onto Finn’s Christmas bedroom! I really love having Finn’s bedroom on our main floor and close to the kitchen and my room. I can turn on his Alexa… “Alexa play nursery rhythms for toddlers” and he happily sings along and plays while I work on things. I put that fluffy flocked tree in his room (I found it last year at Home Goods and I couldn’t get it home fast enough!). Added some chunky felt garland around the tree and it just makes it feel more like a kids Christmas tree! And can you even handle that large alligator? I totally bought that instead of clothes while shopping on Black Friday for a good deal. I knew he would love jumping on it. See the little alligator? The other morning he woke up early and brought in both the alligators to my bed and told me “be the baby alligator”. Never want to forget that. The nutcrackers and the nesting Santas are two things Finn took out of the Christmas tote and plays with often. I found that reindeer head awhile ago. You can find them on Etsy, HERE. I wish I would have thought and ordered one from her! We have the elephant already, I LOVE all her felt heads. Hand-made with love. I added a little strand of pompom felt garland that I made. This is the other side of Finn’s room. See the cute elephant? I didn’t add any Christmas over here. 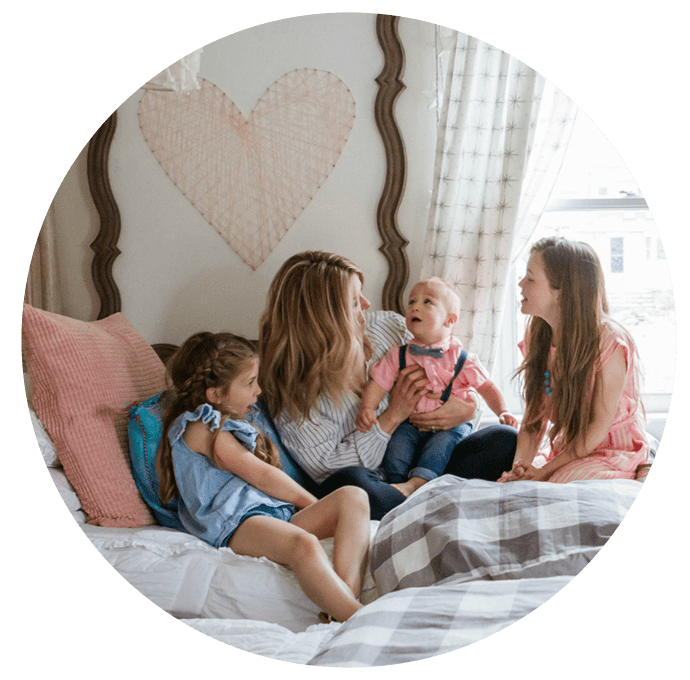 You can shop Finn’s bedroom and popular blog posts HERE. If you missed it you can see our Girls Shared Bedroom for Christmas HERE. You don’t want to miss out on any of these Christmas Bedrooms…. Trader Joe’s Christmas Shopping List! I’m curious as to where you store your beautiful trees and holiday decor in the off season? 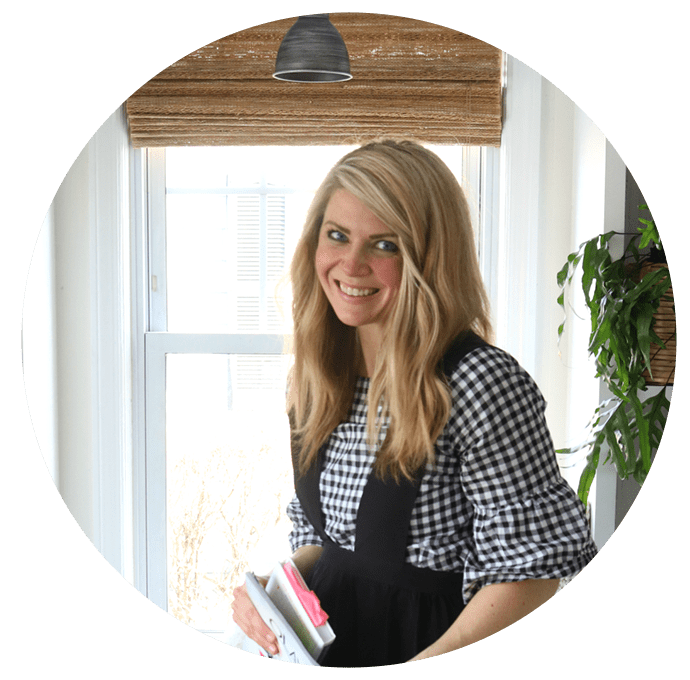 Brooke, I just love reading and seeing your blog posts!! Your home is so inspiring… especially for the holidays! Love it! I LOVE all this! Curious about the pom pom garland on Finn’s tree? I’m sorry if I missed the source. I checked but didn’t see it. Merry Christmas to the Christens! I was going to ask the same question about Finn’s garland. I think I remember seeing them at Michael’s last year and I should have snatched it up! So adorable! yes I got that at home goods this year!! I hash tagged you my picture because I don’t know how to send it to you because I’m old!! You are costing me a lot of $$& lol but so much fun to follow you. haha! thank you!! You might have sent it- I can loose my Dm messages! I love how cozy your home feels!! I seriously love every room in your house! Curious where the string lights are from in Finn’s room. I Tried clicking the shop link to shop his room and it took me to another site. Do you have details or tutorial for bedroom ceiling? Thanks! Random question but where did you get the woven basket/hamper with the lid in your bedroom from?? I can’t seem to find that size with a lid anywhere. yes! Here- https://rstyle.me/~alijH I have the large! It is a queen! We just have a really small tall dress and one other high-boy. We don’t have a ton of clothes….